This beautiful dining room table is shown with four side chairs, but a 22-inch leaf gives you the flexibility to add more seats when hosting guests. 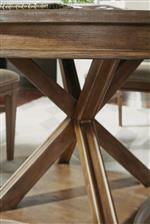 Eyes are naturally drawn to the unique angled trestle-style base, which brings the contemporary touch to this rustic-modern design. The upholstered chairs not only give this set an inviting look, but they provide an exceptionally comfortable seat as you gather with friends and family. 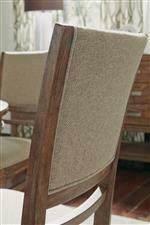 The Hampton Dining Group Rustic 5 Pc Dining Set by Flexsteel Wynwood Collection at AHFA in the area. Product availability may vary. Contact us for the most current availability on this product. 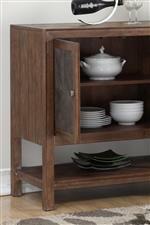 The Hampton Dining Group collection is a great option if you are looking for Rustic furniture in the area.